width = double however wide you want it + 1" (seam allowance). Step 2. Fold the waistband in half lengthways, inside out, and using a 1/2" seam allowance and a straight stitch, close one end. The other end will be the fastening flap, so still using 1/2" seam, and using the image as a guide, stitch a reverse L-shape finishing 2" in from the edge. Step 3. Turn right side out and press the seams. 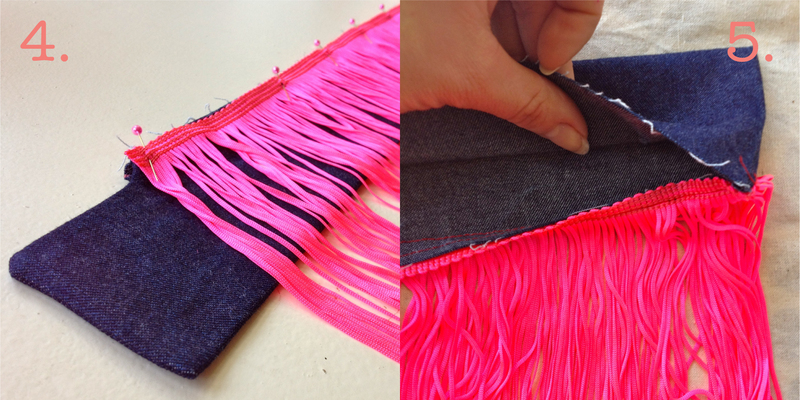 Step 4: Pin fringing to one open length of the waistband and stitch in place. Step 5: This part is a little tricky... Press the seamed edge of the fringe inside the belt and press the other open length inwards as you go. This will sandwich the fringe inside the open edges of the belt ready to be stitched shut. Step 6: Pin the opening shut, being careful to best align the two folded edges so you can be sure to sew them together. Step 7: Top-stitch openings and all around the edges of the belt. At this point you can even use a contrasting thread and do some decorative stitching. Step 8: Almost done! All that's left to do is add your fastening of choice. Sew on a beautiful old button you want to show off, keep the lines clean by sewing in some hooks & eyes or add some strong snaps. I chose snaps this time to complement the slightly tacky Western look I've gone for: dark stretch denim, fluo pink fringe and clean white snaps, reminiscent of a faded denim shirt. Hey presto and there you have it. 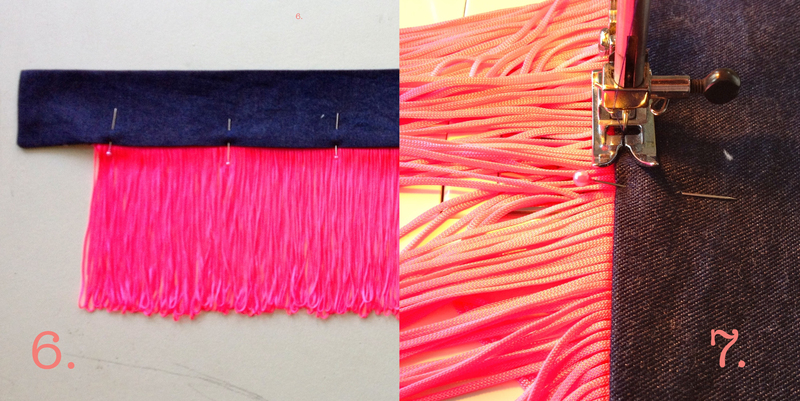 A detachable shimmy belt for those days when all that's missing is a good ole bit o' fringe.